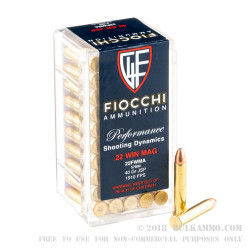 This 22 Win Mag from Fiocchi is a great round for hunting small game or plinking at the range. 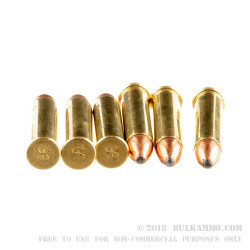 Outfitted with a 40 grain, jacketed soft point bullet, this round is designed to expand on impact. This expansion, combined with traditional Fiocchi accuracy, will lead to a quick and straightforward hunt. 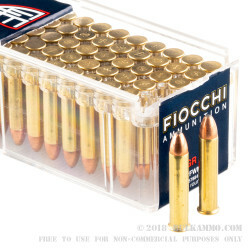 Founded in the hills of Italy in the 19th century, Fiocchi has built a fantastic reputation for quality manufacturing. 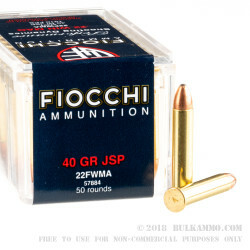 They’ve brought that reputation stateside with a US-based headquarters in Missouri, giving American shooters easy access to Fiocchi’s famous precision ammo.